Yesterday's cold rainy weather was perfect timing for Brooklyn's own Char4 and General Greene to battle in a chili takedown. Apparently both chefs come from Texas. Yee-haw ya, I am too! Many thanks to Anna who filled me in on the event. Weve been trying to get together since October 2009! And a special hello to Joaquin who dropped by after his wine tasting class. 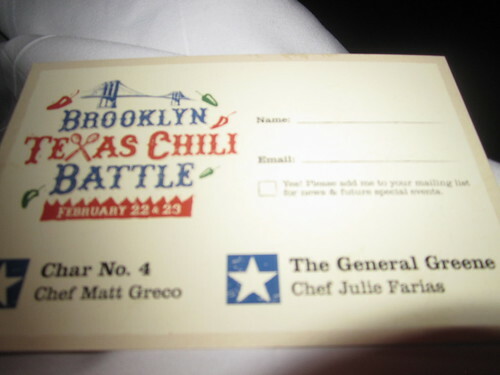 So the cook off was held at Char4: For $21 you get side-by-side comparison of each chef’s chili, as well as a complimentary shot of whiskey and a bottle of beer. 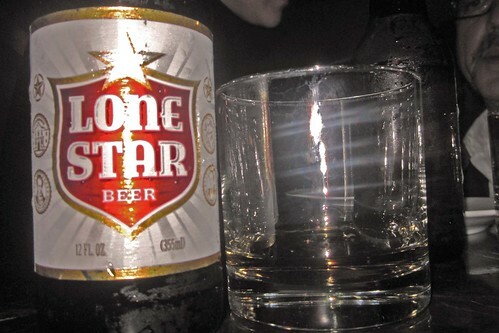 Oddly, Ive never had LoneStar Beer before in Texas. I grew up on Budweiser? (Also, it was generous that they provided drinks, but I ordered a sazerac prior to being seated and that could be a new favorite besides bacon infused old fashioneds ). 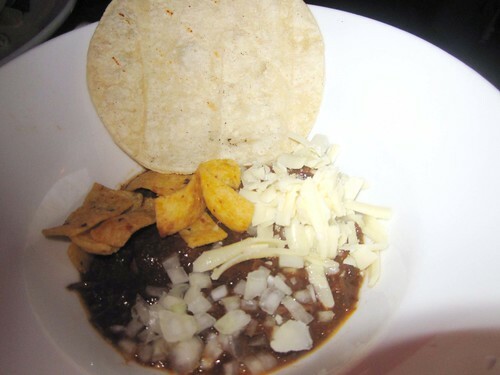 First contender was General Greene's beef chili topped with raw onions, cheese, frito lays (I thought of FoodTease as I chomped them down) and tortilla. My first bite was 'Wow, very overpowering taste". The spices and sauce used were not the combo I was used to-- very hickory. And then I tasted Char4's smoked short rib and pork shoulder chili. It was sweet but too runny. The presentation was not up to par with Generals'. 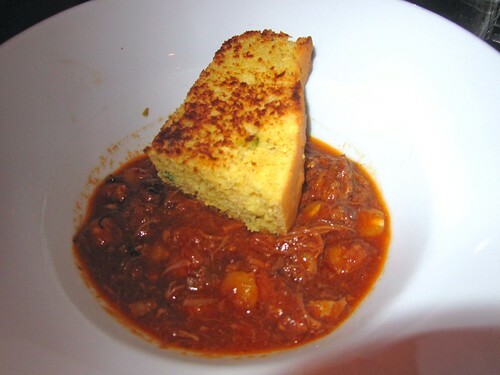 And the cornbread looked like a piece of white toast under Char4's dim lighting so I didnt taste it until I was basically done with my chili. Even so...not outstanding enough to win me over. Long story short: General Greene was our favorite. Despite not being familiar to our taste palate it was more impactful than Char4 and the presentation and extra ingredients won our favor. 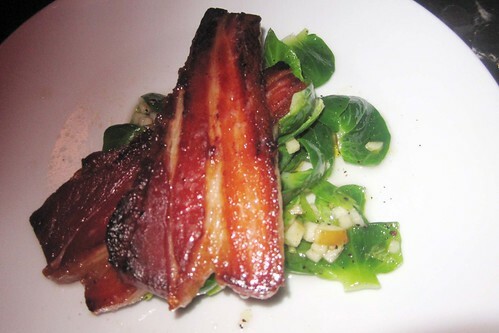 But FYI Ive eaten at both locations and they are equally worth a trek to Cobble Hill and Fort Greene! (Post does not end here). A real mealcan not begin or end without sides and dessert! 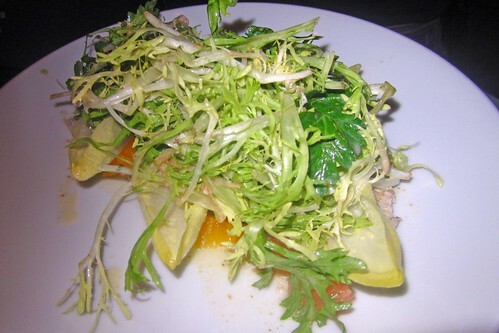 Tried to be slightly health conscience and skipped the pork nuggets and went for the frisee salad with grapefruit and other things delicious that I can not remember. For dessert, all 3 sounded good so we narrowed it down to 2. 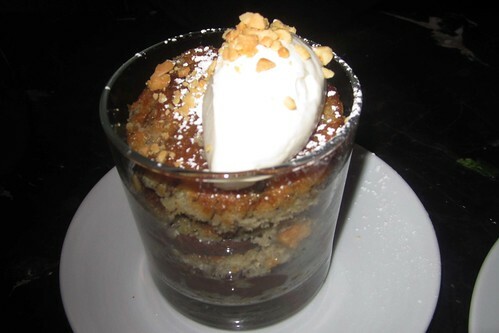 We first tried the banana bread and chocolate layers with whipped cream. It was a bit dry if you didnt get enough of the chocolate layers. But no loss since we ordered a second option. And it was a winner! 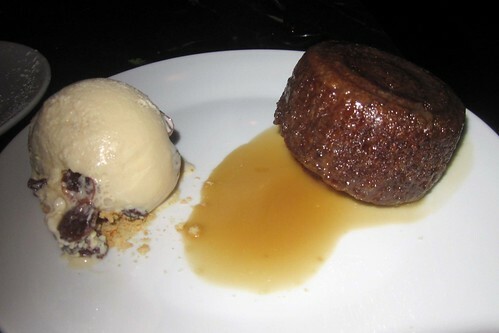 The warm sticky toffee pudding and raisin ice cream is how everyone should end a meal! 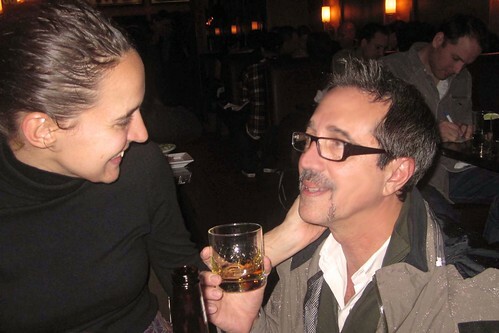 And again, dont forget to try a sazerac!